If you are looking for a free Siri alternative for your android device, you may consider Vlingo virtual assistant or Speaktoit assistant. The Apple’s Siri app is yet another triggering point of Apple-Android battle. It is quite notable that there are free Siri-like apps already available free in the android market. You can easily make use of this great app by simply selecting the right one for your device. When iPhone 4S kick started a new era with the introduction of the personal assistant “Siri”, Android arena came up with a multitude of decent voice assistants to enjoy the most out of your android phones. Hope you know much about Siri and how it works. It answers all your questions intelligently just like a human being and when you ask weird questions, Siri gives funny replies! This app was one of the major factor behind the success of iPhone 4S in the smartphone marketplace. But without any doubt we can say that it was a modified version and copy of the Google Voice. 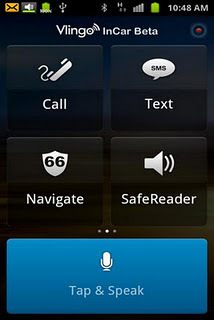 Even though it lack the ability to answer your questions, it lets you text and place phone calls using your own voice. Speaktoit is a free virtual assistant for your android phone which helps you to find information, answer your questions, connect you with different web services and launch apps. You can also make it do simple math calculations. What sets this virtual assistant app apart is that, besides information and humor, it explicitly offers both voice customization and avatar. This app is still in the beta phase and we can expect more functions in the future. The interesting part is that the app allows you to select from a multitude of assistants which includes old professor, blonde girl, handsome agent or brunette girl. You can talk to your assistant as if human and it avoids the hassles of remembering commands. Using text box, you can simply type to it and it will answer questions with different facial expressions! But the only drawback is that you will need to have an internet connection to make it work! Vlingo is the most powerful and well-known virtual assistant for android powered smartphones. It can simply use your voice to send emails and texts, make calls, search the web, dial numbers, find places and launch other apps. The impressive part of this siri-like app is the Car mode by which you can activate the app by using the “Hey Vlingo”command. This is an efficient app that recognizes your voice easily but like the speaktoit app, you will need an internet connection to use Vlingo virtual assis. 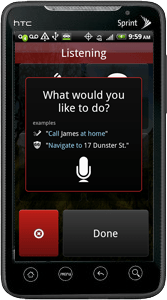 Other than these two free android apps for voice recognition, you can go for apps like ‘Edwin’ or ‘Iris’. thanks for this great suggestion! Yes, Siri is the best one according to user reviews.